The users are requested to cite the No.1 of the papers given below for referencing JENDL-4.0. Purpose To provide a Japanese standard library for fast breeder reactors, thermal reactors, fusion neutronics and shielding calculations, and other applications. Updated files of JENDL-4.0 are distributed when the data were modified because of fatal compilation etc. 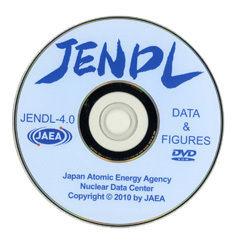 “JENDL-4.0 Plus Files (JENDL-4.0+)” is the collection of data files newly evaluated or reevaluated after the JENDL-4.0 was distributed (in May 2010). The JENDL4.0+ may include not only the nuclides already evaluated for JENDL-4.0 but also nuclides not evaluated yet. There is no JENDL-4.0+ file now. DVD-ROM containing JENDL-4.0 original files, pointwise files, and cross-section graphs is available on request. Available to select nuclides and reaction types, fix axes, plot one or more data, and download graph data. Tables of thermal cross sections, resonance integrals, etc. Available to generate some types of fission yield graphs. Available to plot average capture cross section graphs based on JENDL-4.0. Available to retrieve information on resolved resonances, which is based on the resolved resonance parameters in resonance region adopted for all nuclides in JENDL-4.0. K. Shibata, O. Iwamoto, T. Nakagawa, N. Iwamoto, A. Ichihara, S. Kunieda, S. Chiba, K. Furutaka, N. Otuka, T. Ohsawa, T. Murata, H. Matsunobu, A. Zukeran, S. Kamada, and J. Katakura: "JENDL-4.0: A New Library for Nuclear Science and Engineering," J. Nucl. Sci. Technol.. 48(1), 1-30 (2011). O. Iwamoto, T. Nakagawa, N. Otuka, and S. Chiba: "Covariance Evaluation for Actinide Nuclear Data in JENDL-4," Proc. 2010 the International Conference on Nuclear Data for Science and Technology (ND2010), J. Korean. Phys. Soc., 59(2), 1224-1229 (2011). G. Chiba, K. Okumura, K. Sugino, Y. Nagaya, K. Yokoyama, T. Kugo, M. Ishikawa and S. Okajima: "JENDL-4.0 Benchmarking for Fission Reactor Applications," J. Nucl. Sci. Technol., 48(2), 172-187 (2011).